I snatched my 6 year old from her certain (very nearly) demise (at the very least an "owie") at the hands of a moving swing WHILE ducking to avoid any injury to myself as well. I managed to open a 56 ounce bag of M&Ms and proceeded to eat ONLY seven candies. SEVEN. If that's not the mark of a ninja...I don't know what is. I dropped my cellphone while walking to the playground and without even THINKING -- I kicked it before it hit the ground. You know... to cushion the landing...twelve feet away. Because... you know what?! If you're not a ninja already, I'm not going to explain all the intricacies of ninja-strategy involved when kicking a falling cellphone. Either you get it or you just don't. I will, however, show you just how I made these watercolor nest cookies because they are SUPER fun to make!! 1. Outline and fill an oval cookie with white icing. Let it dry overnight. 2. Use watered down brown food coloring to paint a nest. Start by drawing a flattened oval at the top for the opening of the nest. Add short strokes for sticks to round out the shape of the nest. Continue adding sticks with short strokes and food color of varying saturation. Add a little black to give it more variation. Clean your brush and swirl it around the inside of the nest to give that a little color as well. Finish with tiny strokes of white food coloring. Let it dry for 20 minutes. 3. Pipe an egg on one side of the nest. Let dry for 20 minutes. 4. Pipe a second egg next to the first one. Let dry for another 20 minutes. 5. 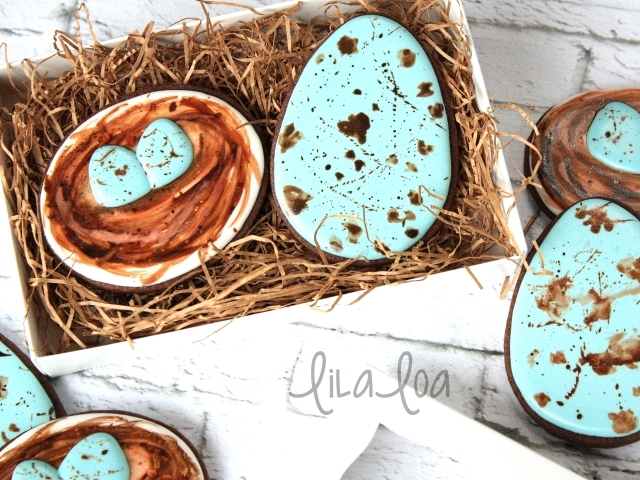 Dip a soft paintbrush into watered down brown food coloring and flick it on to the eggs. It's okay if it gets on the nest. No one will ever notice. It's actually easier than it sounds. Allow me to convince you with this video. Grab the OVAL CUTTER SET. 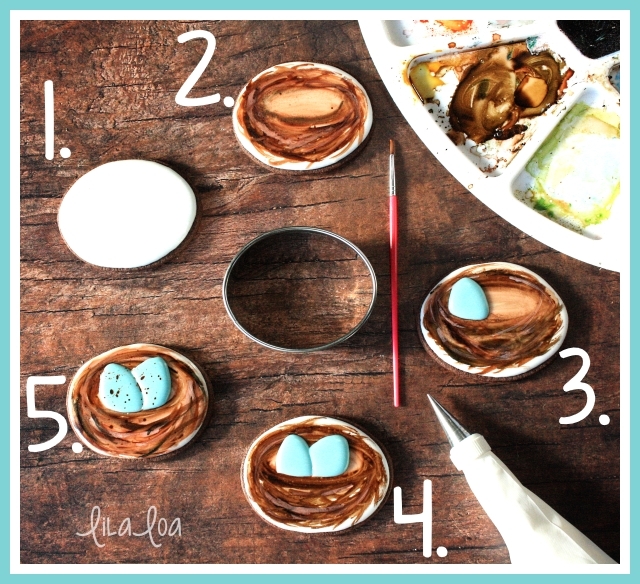 And right on trend with a "rustic" Easter, check out my PAINTED WOOD GRAIN BUNNY SILHOUETTE tutorial and my REALISTIC WOOD PLANK BUNNY tutorial.